Frank Singleton’s Weather Site Frank Singleton’s Weather Site for Sailing covers how to get weather forecasts from the web and elsewhere, how to use them, and more. Specializes in European and Mediterranean weather but has links to other areas. Noonsite.com Comprehensive site with updated information on worldwide cruising destinations. The site is the work of Jimmy Cornell, author of the best-selling books "World Cruising Handbook" and "World Cruising Routes"
Cruising Guides and the archive of Flying Fish, the club journal giving first hand information of cruises in all the navigable waters of the world, are just some of the items that can now be viewed by club members on this site. Seven Seas Cruising Association International organization of boaters with over 10,000 members. The monthly bulletin is an excellent source of cruising information. A wonderful community of boaters with many services and get-togethers throughout the world. World Cruising Club The World Cruising Club sponsors the annual transatlantic rallies known as the ARC and ARC Europe (Atlantic Rally for Cruisers). Caribbean Safety and Security Net Site of the Caribbean Safety and Security Net with information on security and other issues. Doyle Guides Site for Chris Doyle's popular cruising guides to the Eastern Caribbean and Venezuela, containing updates on harbors, way points, etc. LuperonCruising.com Luperón, on the Atlantic side of the Dominican Republic, is a popular port for the cruising yachtsman enroute to or from the Caribbean. This fun site gives you the flavor of Luperón. Panama Canal Authority The Panama Canal Authority's official site. The webcams on the site show boats traveling through the locks. Marina Puesta del Sol Marina Puesta del Sol on the north Pacific coast of Nicaragua, offers a 600 acre resort and a full-service marina. The Baja Ha-ha is the annual 750-mile cruiser's rally from San Diego to Cabo San Lucas. In addition to information on the Ha-Ha, the site has Latitude 38's online "First Timer's Guide to Mexico"
Baja Naval is a full-service boatyard and marina in Ensenada, Baja California. The site has information on marina and boatyard services, plus information on clearance procedures. Information on "Mexico Boater's Guide", "MexWX: Mexican Weather for Boaters" and "Cruising Ports: Florida to California via Panama" by Captains Pat and John Rains. Site has updates to guides as well. Sea of Cortez, A Cruiser's Guidebook "Sea of Cortez, A Cruiser's Guidebook", by Shawn Breeding and Heather Bansmer, details the many anchorages found within the popular cruising waters of the Sea of Cortez, Mexico. The well-designed guide is full of over 100 up-to-date chartlets as well as stunning photography. Guide updates available on the site. Gerry Cunningham has been sailing the Gulf for 45 years and produces three detailed cruising guides and 15 navigational charts to the Sea of Cortez. Ths site has information on the guides as well as updates. The "Southbounders Cruising Notes" were compiled by Daisy and Ed while in Zihuatanejo, Mexico, in 2003. It includes very interesting and informative notes from experienced cruisers who had already cruised Pacific Central America, the Galapagos, Caribbean Panamá, and the NorthWest Caribbean. SailFest is a five-day festival that combines fun and games, heart-felt volunteerism and an outpouring of international friendship. Although the tone of the event is light-hearted, the cruiser s’ goals are serious – to raise funds for the education of Zihuatanejo’s poorest children. Cocktail parties, live auctions, sailboat and dingy races, poker chases, kids day, beach parties, seminars, ham radio tests, chili cook-offs, street fairs, regattas and just some good old fashioned manual labor at the schools are just some of the events that highlight this gathering of "free spirits". Bahía Redonda Marina Bahía Redonda Marina in Puerto La Cruz, Venezuela is popular with cruisers wishing to visit Venezuela. Bahia Redonda is in the El Morro Tourist Complex which has 12 miles of navigable canals located between the twin cities of Puerto la Cruz and Barcelona. The international airport is a 15 minute taxi ride away. Colombia Coast Update The Caribbean Compass has the Kenoffel's Guide to the Colombian Coast available for download from their homepage. ONSA, Venezuela ONSA is a Venezuelan organization dedicated to marine security. The site is in Spanish but there are pages in English with information on security problems in Venezuela. Atlantic Islands "Atlantic Islands" by Anne Hammick covers the Atlantic island groups, Azores, Madeira, Canaries and Cape Verde. Many yachtsmen use these islands as staging posts during Atlantic passages - the Canaries for yachts heading westwards to the Caribbean in the winter and the Azores for yachts on passage to Europe in the summer. This pilot provides all the information the visiting yachtsman or woman will require for safe navigation and enjoyable, well-informed cruising. Comprehensive site with updated information on worldwide cruising destinations including all major European ports. The site is the work of Jimmy Cornell, author of the best-selling books "World Cruising Handbook" and "World Cruising Routes"
The BBC website has lots of resources online for learning Spanish: online courses including audio and video, plus articles, cultural notes, etc. An excellent way to study Spanish while enjoying the Venezuelan Andes. This school is very popular with boaters who visit Venezuela. And the owner-director of the Institute, Cathy Jensen de Sánchez, is a sailor with a boat in Puerto La Cruz. Argo Steve and Deborah write about their travels in the Eastern and Western Caribbean aboard Argo, their Valiant 42 sailboat. Exit Only This website chronicles the adventures on the Abbott family on board Exit Only, a twelve meter catamaran with over thirty thousand miles under her keels. Charli Holt holds a special place in my heart. She sailed into Trinidad aboard her sailboat Lady Charli and fell in love with the island. In her 70s, when health problems halted life aboard, she created this web site to help cruisers keep in touch. You might find news of your friends on her site. Charli passed away in June 2004 and friends plan to keep her web site going. Nine of Cups David and Marcie sail Nine of Cups, a Liberty 45 cutter-rigged sailing yacht. Great stories on the trip from the US, through the Caribbean, and down the Pacific coast of South America, and around to Argentina, across the Atlantic to South Africa. Website of Barb, Tom, Kate and Kenna Theisen ov s/v Out of Bounds. Lots of information and inspiration on how to live the cruising lifestyle. Articles on preparations, cruising children, destinations, pets, and life afloat. Soggy Paws Dave and Sherry of s/v Soggy Paws, a CSY44, describe their travels in the Western Caribbean. The site also has info on computing topics for cruisers: wifi antennas and cruiser websites. Allende Books, La Paz, Mexico English-language bookstore in La Paz, Baja California Sur, Mexico. Carries maps and guidebooks, English-Spanish dictionaries, cookbooks, novels, histories, magazines, children's books, including SPANISH FOR CRUISERS. Bellingham Chart Printers Bellingham Chart Printers has been reproducing quality black and white navigational charts for over 33 years. They also carry electronic charts, software, and cruising guides. Nautical Mind Canadian-based marine bookseller and chart agent. Sells online. Carries French for Cruisers and Spanish for Cruisers. Shop The Chart and Map Shop in Freemantle, Australia, stocks thousands of charts and maps covering most of the globe, and books related to boating, travel, 4Wdriving and the outdoors. Cruising Compass Free weekly e-newsletter from Blue Water Sailing magazine with news, notes and tips for cruisers and sailors. Readers are from all points on the globe and are invited to e-mail or send photos from every ocean and continent. Furled Sails Podcast Weekly sailing podcast focusing on cruising and recreational sailing. Noel and Christy Davis interview famous sailors, marine authors, and people out doing fun stuff aboard boats. Beth Leonard Beth Leonard is the author of three cruising books, from the inspiring to the thoroughly practical: "Blue Horizons", "Following Seas", and the newly released second edition of the "Voyager's Handbook". "Blue Horizons" won the Outdoor Literature category of the 2007 National Outdoor Book awards, the first time a sailing book has been awarded this prize.This website has information on her books in addition to extensive information on the voyages that Beth and her partner Evans Starzinger have taken on their boats s/v Hawk and s/v Silk. Bruce Van Sant Bruce's popular books including "Passages South", and "Tricks of the Trade" have guided generations of cruisers from the US to the Eastern Caribbean. Captain Dr. Dave Captain Dr. Dave LaVigne has written "Wilderness Veterinary Medicine for Cruisers and Other Outbackers". Dave and his wife cruise aboard s/v Fidelis. The site has lots of information of interest to those who cruise with pets. Cruising Companion Publications Marti Brown's web site with information on her two books about HF radio use: "HF Radio Email for Idi-Yachts" and "Marine SSB Radio for Idi-Yachts"
Doyle Guides Site for Chris Doyle's popular cruising guides to the Eastern Caribbean, containing updates on harbors, way points, etc. Excellent guides. Ed and Helen Muesch Ed and Helen Muesch's web site covers their travels aboard s/v Tahlequah plus details of Ed's book "Personal Best: Chasing the Wind Above and Below the Equator"
Eileen Quinn Music for sailors ... and normal people. Eileen writes and sings about the cruising life as she and her husband David sail aboard s/v Little Gidding - great music! Island Hopping Steve Pavlidis' web site. Steve is author of popular cruising guides for the Bahamas through the Caribbean. Contains updates on regions covered in the guides. Jimmy Cornell Jimmy Cornell is author of "World Cruising Routes" and "World Cruising Handbook", both excellent resources. His latest book, "A Passion for the Seas, Reflections on Three Circumnavigations" is a beautiful book, and a great read. I particularly enjoyed learning more about his early life -- highly recommended! Lin and Larry Pardey Lin and Larry Pardey's website has information on their many books, DVDs, and seminars . I devoured their books years ago before I first went cruising! Liza and Andy Copeland Liza is the author of four books about cruising and a frequent speaker at boat shows. Her books include "Cruising for Cowards", "Just Cruising", and "Still Cruising"
Managing the Waterway Managing the Waterway cruising guides, written by Mark & Diana Doyle, are cockpit-friendly guides that provide information page-by-page and mile-by-mile. The Intracoastal Waterway guide covers Norfolk, Virginia to Miami, Florida. The Florida Keys guide spans from Miami, Florida to the Dry Tortugas. Sailco Press Site of Corinne and Charles Kanter. You can find Corinne's classic "The Cruising Kiss Cookbook II" here as well as marine surveyor Charles' book "Cruising in Catamarans". Sailing Grace This true story, begins with John Otterbacher flat on his back in a local health club, gasping for air. It ends thirty-one months and four thousand miles later when he, Barbara, and their two youngest children maneuver their sailboat, Grace, into Schull Harbor, Ireland. A gritty account of their family’s struggle to do better than simply survive, it is also a commentary on how love heals, dreams energize, and trauma can be a wake-up call. Suzanne Giesemann Suzanne Giesemann has written "Living a Dream" and "It's Your Boat, too" while sailing aboard s/v Liberty through the Americas, and across the Atlantic to the Med.. This site has information on their travels, plus information to help others who wish to realize their cruising dream. The Ministry of Rum Cruiser Ed Hamilton writes about the rums of the Caribbean - with information on visiting the distilleries in the islands. Ed's book has led us to some great discoveries in the French islands. The Sailing Adventures of "La Boatique" Susan Foote Wagner's accounts of sailing her sailboat La Boatique from Ohio to New Zealand. 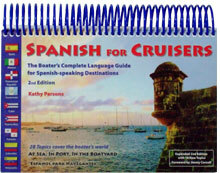 Includes an account of using SPANISH FOR CRUISERS to aid a disabled fishing boat in Venezuela. Yoga Onboard Kim Hess is a full time yoga instructor in Miami Beach and passionate not only about yoga but for the sailing lifestyle. She is bringing these two loves together in the form of seminars, workshops, private sessions, a book and dvd. AirMail Airmail is the software program that we use to receive email over our SSB/ham radio. Download the program here or get info. ATN Etienne Giroire founded "ATN inc" in 1985 after 15 years of extensive racing, delivering and skippering maxi boats. His Spinnaker Sleeve, Tacker, Gale Sail, and Top Climber are widely used by offshore sailors. Boat-links.com "The Mother of all Maritime Links - John's Nautical Links" - huge directory of website links relating to boating, boatbuilding, maritime history, cruising, etc. Conchy Joe Conchy Joe ("Serious Information for Serious Cruisers") is a new web site with cruisers's message boards and information of interest to cruisers. Cruising Solutions Cruising Solutions was founded and developed by full-time cruisers and carries "cost-effective equipment for life under sail". We have several of their products aboard: their headsets are great when anchoring or navigating through coral. Hotwire Alternative energy and cruising products from wind generators to solar panels. We use several of their products aboard Hale Kai. Ship Captains Medical Guide The Ship Captain's Medical Guides is available to download by chapter in PDF form from UK's Maritime and Coastguard Agency. Information on purchasing a print copy of the Guide is at the top of the web page but if you scroll down, you will be able to download the guide to your computer for free. Strictly Sail Strictly Sail Boat Shows offer exhibitors from around the world, plus seminars and special events. Shows are held annually in St. Petersburg, Miami, Oakland, Philadelphia and Chicago. I speak at several of these shows each year. See the Seminars page for details. Cheat Sheets This site allows you to print a handy currency conversion table that you can carry with you. Useful for converting any currency (euros, pesos, bolívares, quetzales, lempiras... ) to dollars or pounds. Winlink Winlink is a wonderful system that ham radio operators offer for receiving and sending email aboard boats. I've used the service for many years and still can't believe that such a wonderful service is offered by this group of volunteer ham operators.